Take adventurous and exciting excursions with the family in this Outback Ultra Lite travel trailer! With its private bunkhouse suite that has its own half bathroom and exterior entrance and its front private bedroom that has a laundry chute, built-in pet kennel, and its own barn-door entrance into the large walk-through bathroom, this unit is fabulous for hosting extra guests or family as you tour the country together. 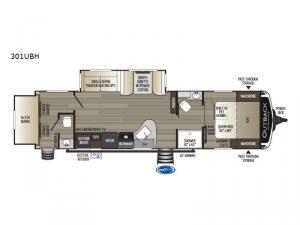 Because this trailer also comes with a sofa sleeper and booth dinette in the main living area, you will be able to gather together each evening for a late-night movie on the 40" TV.